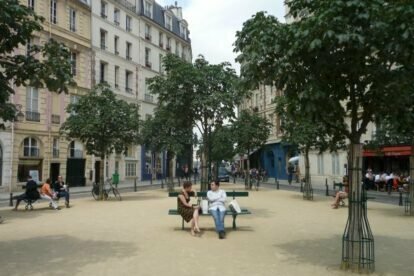 Although one of the most central squares in Paris, Place Dauphine is not overrun by tourists, probably because of its small and hidden entrances which partly conceal it. But this partial isolation is probably what makes it so charming. The style of the oldest houses (brick-stone-slate, like on the first royal square, Place des Vosges), its curious triangular shape, its traditional restaurants, but more than anything else its quietness while still being only a few steps from busy Sainte-Chapelle and Notre-Dame make it a great place to have a break, sit down for a few minutes on a bench, have a picnic and, during nice seasons, observe pétanque players. All around the square, in addition to the restaurants, you’ll find art galleries and also the very austere Librairie de la Cour de Cassation, acknowledging the proximity of lawyers’ Bar and the final Court of Appeal. This square was the second royal square, dedicated to “Le Dauphin” (crown prince) Louis XIII by his father “the good King Henry IV“. The latter, depicted on the equestrian statue on the Pont Neuf, is sometimes considered as the first urban planner of Paris in early 1600′ (same era as Rue Dauphine and the Pont Neuf, first Parisian bridge not to be lined with houses, thus looking over the river).